Sign up for our newsletter to hear about our great deals! 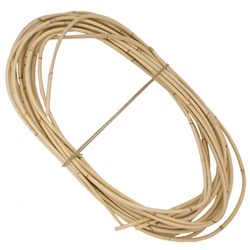 The smaller diameter rattan is use for wicker repair or basket weaving. It varies in color from light tan to a darker brown. All sizes are sold by the pound. This item cannot be returned for credit or refunded. The maximum length we can ship these via UPS is 8 ½’. The length can greatly affect the shipping costs. Additional oversize shipping rates will apply. You will be contacted with exact shipping charges and options after your order is placed.